Rough chop your dandelion and beet green together. Combine all ingredients, except olive oil in a food processor. Pulse about 10 times, scraping down the sides of the food processor bowl with a spatula every few pulses, until everything is minced together and about the same size. Turning the processor on low, slowly drizzle olive oil in until everything is well combined and the pesto is the consistency you like. For the dough, combine the water, yeast, honey, and olive oil in the bowl of an electric mixer fitted with a dough hook. Add 3 cups flour, then the salt, and mix. While mixing, add 1/2 cup of flour, or enough to make a soft dough. Knead the dough on low speed for about 10 minutes until smooth, adding a little bit more flour, if necessary, to keep it from sticking to the bowl. When the dough looks as though it's smooth and elastic to the touch, take out of the bowl and place the dough in an oiled bowl. Turn it several times to cover it lightly with oil so it doesn't get crusty. Cover the bowl with a kitchen towel and allow it to rest for about 45 minutes at room temperature. Divide the dough into six equal dough balls. Roll each one until it is smooth. Place the balls on a baking sheet and cover them with a damp towel. Allow the dough to rest for 10 minutes. Roll and stretch each ball into a rough 8-inch circle and place them all on a plate. Cover with the same damp towel while the grill is heating. Heat the grill to medium-low. When heated, place pizza dough, two at a time, on the grate, and cook for five minutes. 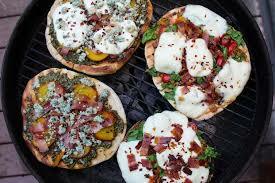 Flip and begin dressing the pizza with pesto first, beet slices second, prosciutto, and blue cheese lastly. Drizzle with good olive oil and close the grill. Cook for 5 minutes more or until the topping have warmed. Cut into slices and enjoy warm or cold.